Printable math patterns worksheet can be printed so that we can engage our children in solving these worksheets. In math patterns we need to find the next counting numbers in the series to maintain an order. We need to find the exact missing number that from the group of numbers. The counting numbers may be counting up or counting down. We need to find the missing numbers that completes are counting. 1. What is the number in place of ‘?’ in the following diagram? 2. 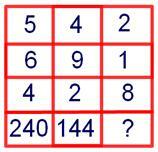 What is next number in the series? 0, 7, 26, 63, 124,215, ……… . 3. Choose the response that will continue the series. 4. Series: 8, 14, 26, 48, 98, 194, 386. Which of the terms of above series is wrong? 5. Which one of the following numbers is wrong in the given number series? 6. Which one of the following numbers is wrong in the given number series? 7. 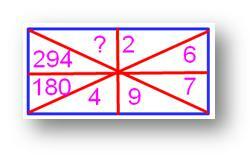 Which number will come in the place of question mark (?)? 8. What will come in place of the question mark (?)? 9. What will come in place of the question mark (?)? 10. What will come in place of the question mark (?)? Online math patterns worksheets are available for students and even parents and teachers can encourage and suggest the child to practice patterns in math so that they get easily how to find patterns in math while playing. Here we discussed math lesson plans about patterns, if any doubts you can fill-up the comment box.